I left for camp on my 20th birthday so we did not get to have a celebration on the 9th. Finally last night on the 29th everyone was home, so we had dinner and a cake. There were so many candles on my cake I did not think I would be able to blow them all out. Matt helped me blow out the candles. This year it was like my birthday lasted for twenty days. Oh...forget the drama, c'mon mom. Would you want to ride a horse named Jackie-O? Where is my Ridge? I want Ridge back. Our Sarah is one smart gal. Always the thinking one. Crafty, clever and in control. 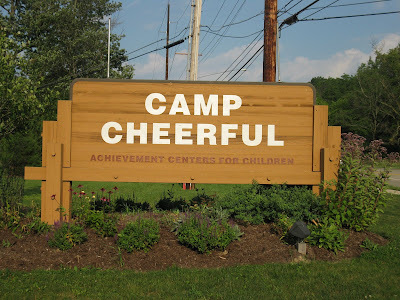 For the past four years, Sarah and I have been making the 45 minute drive from our house to Strongsville for therapeutic riding at Camp Cheerful. We have written about it many times on this blog. I know better than to schedule anything else on a Saturday(including the Buddy Walk in Cleveland today) because she looks so forward to riding. Most weeks are pure delight. Sarah has made so much progress in the past year. She is manuevering and trotting on her own and quite pleased with herself. This fall session we have a new instructor and she is ready to push Sarah a little. One way to do that is by having her ride on a faster horse. So today we get there about ten minutes early. The instructor comes over and tells Sarah in her perkiest voice that she is going to be riding Jackie-O. As she walks away Sarah gives her that look, you know, the disgusted teenage girl look. The one that says, "Like h...e...double hockey sticks, am I riding that horse." But she mounts without a complaint. Hmm.... So I watch for a minute or two and Sarah gives me the thumbs up. That's our cue that I can leave. Sometimes I go fill the gas tank or grab a coffee. Today, something told me I better stay put. So I sat in the car and read. Sure enough. Forty minutes into the ride, just about time for the trotting to begin, I see a volunteer running for my car. "Sarah needs you, quick." I walk over to the big double doors with the gate, which has already been opened for my arrival. As I step into the ring, my foot sinks into the dry, dusty dirt. While quickly scanning for piles to avoid, I think to myself, "Good thing I'm wearing washable flip flops today." I'm not overly alarmed, as I had been previously warned by that look on Sarah's face there might be drama today. Just as I glance up, I see Sarah slouch forward on the horse like she is about to faint. Oh, Lord have mercy. They have already removed her helmet and by this point she is surrounded by the instructor and many volunteers, all falling prey to her acting abilities. I look for Doug who has been with her since she started at this barn. He knows her well and he doesn't seem too ruffled. I take his cue. Just as I am about to tell her to "Cowgirl Up," rodeo lingo for get back up and get a move on, she takes her hand and brushes it across her forehead in great dramatic fashion and then begins to slide off the horse. Quicker than quick, I see she is about to fall into the dry dirt. I leap forward and catch her under her arms as she goes limp like a ragdoll. I look at her and smile as I know exactly what is going on. Then I jokingly say " C'mon Sarah, are you kidding me? I have black seats in the car." I brought this note home today. My mom said she was very proud of me because I have a great attitude and I have been working hard. 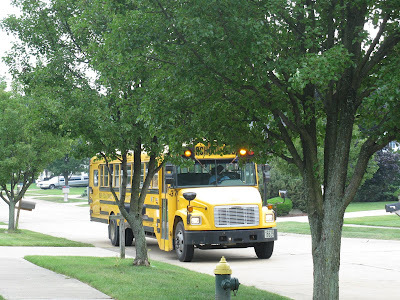 I was so happy when the bus turned on my street. Today was my first day back at CEVEC and I have a new job this year. But right now I am exhausted. I just can't wait to get inside to take a nap. I will tell you more about my day later. See ya. 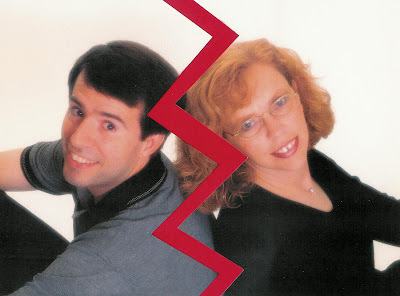 ...I already had this series on Marriage/Divorce ready to go before John and I received those phone calls on Friday. But gosh, it was such a better story than the one I had in que, I just knew I had to do a partial rewrite. It is such a great example that just when you think things are humming along, that tsunami wave blast comes in. No this picture isn't a tsunami, it's an example of the ongoing effort to keeping it alive. The marriage that is. Working to strengthen the bond. I think it is also another touching photo by Peggy Farren, so no copying please. I really cannot over emphasise the power of communication. 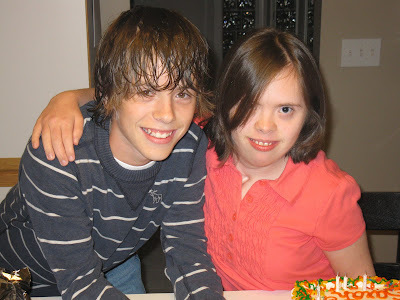 In the Newsletter of the National Down Syndrome Congress Volume 32 #4, Renee Schultz wrote a great piece on marriage titled, You Are An Important Two... It notes that she and her husband Ron Baer offered a workshop at the convention in Sacramento. If anyone attended, I would love to hear how it was. -Talk and listen to each other. The quality of your communication is the most critical factor in marital satisfaction. -Disclosing feelings is critical including difficult feelings. Fear cuts off communication and can separate and polarize partners. -Anger is normal, but how we express it is critical. -Take responsibility - no blaming your partner. -As a couple, take time away from your children for the two of you. I personally think that last one is the hardest for our circle. 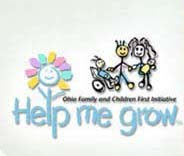 First finding a sitter that is qualified for the special medical needs our kids have is often tough. 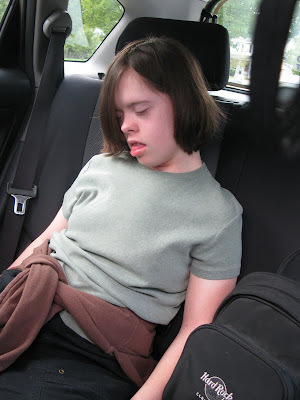 Even if they do not have medical challenges, just finding a sitter as our child with Ds ages can be difficult. So John and I have tried to make our bedroom a sanctuary of sorts. A place where we can be alone. We recently bought a new bed and paid more than we normally might have for the extras knowing that is our place. Our little retreat. Sometimes we have to compromise on the location but being together is so important. As I close up this topic, you might be wondering about the posts that I took down. At dinner that night, both John and TJ told me to put them back up. Before I did though, I added some content to make the reader a bit more clear on the direction the posts were going. I could see the point trying to be made, I just did not agree with the delivery. Communication. Honest, truthful and tender communication. It's the key. P.S. I don't often put music on here but as I was driving to the grocery store on Friday night still shaken from the ordeal earlier in the day, I popped in the new Reba CD. This song, which also happens to be the album title, brought it all back together for me...Keep On Lovin' You. If you have a minute, listen to the lyrics by clicking the word music. ...so the last we chatted, I was heading up to my shower. I've mentioned before that is where I do my best thinking. And yesterday morning was no different. What had happened in those phone conversations with our relative? (btw, it was not my MIL) I don't have a direct link to her thought process, but my hunch is she has some unresolved issues that are causing her to harbor some anger. My blogpost was not the source of that anger, but it caused those unresolved issues to flare, so it became the final straw before eruption. 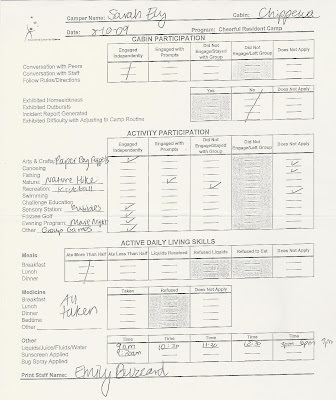 Many, many years ago when I worked for children's services, I had been assigned to a project that was trying to help parent(s) that had been brought to the attention of the system learn appropriate parenting skills. 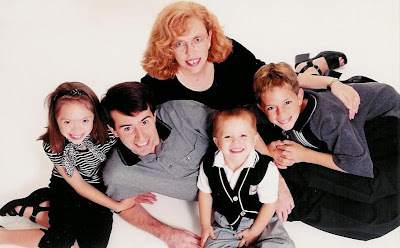 The goal was to prevent their child(ren) from being taken and placed in foster care. What I learned while facilitating this has been beneficial in everything I do. First and foremost, never act when your adrenaline is pumping. You know the feeling. Count to ten, although I usually need to count to 50. Walk out of the room. Take a breath of fresh air. If you can, sleep on it for twenty four hours. That's what I would recommend to our relative. It works great for marriages, too. Let me go back now to my mother-in-law. You probably wondered how I could describe our rocky start without a follow up. When we were in the moment, it wasn't the best of times. But what the controversy did, was require that John and I spend a great deal of time communicating. Really delve into our relationship. What we stood for, what was important to us, where we were going. By the time we walked down the isle, we were solid. 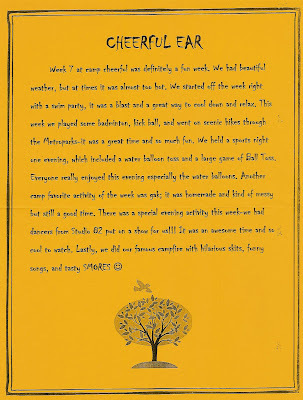 We had no unresolved issues and therefore no latent anger. What I love most about this photo from our August 2, 1986 wedding day, is our hands. Look closely at how tight we are holding on. Our knuckles are white we have such a tight grip. And it was a good thing, for our life was heading in a direction we had never discussed and certainly never planned. 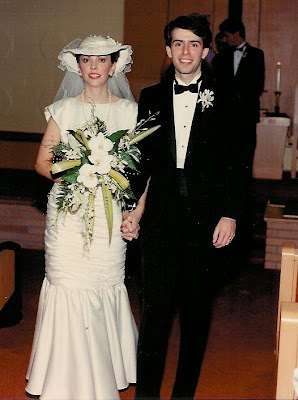 Today, twenty three years later, I can look back on those painful early days and wonder was it By Chance or By Design we were being challenged and fighting over wedding plans and family issues. I truly believe it better prepared us for what was to come. Fast forward to the week of August 9, 1989. Something changed. John and I started out on a parallel path with Sarah. 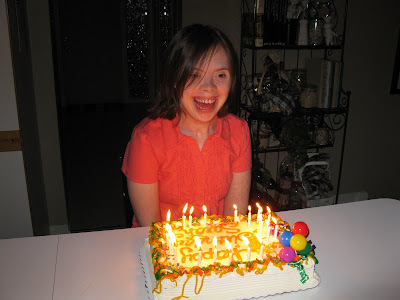 I was by myself when I found out about her having Down syndrome. I had my meltdown moment while I was driving by myself. He had his defining moments with her while he was home alone. And this is really how we managed for the first eight months or so. If you have been following our story you have probably pieced together that for the first six months of her life, we thought she was healthy. When in fact she had a significant VSD that went undetected. When it was finally discovered, she was whisked off to surgery immediately. She had many, many complications and stayed in the ICU for almost two months. 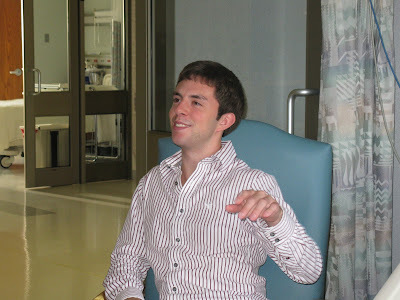 About one and half months into the ordeal, the phone rang in the middle of the night. The clock read 3:27 a.m. We knew it was not good news before I answered. 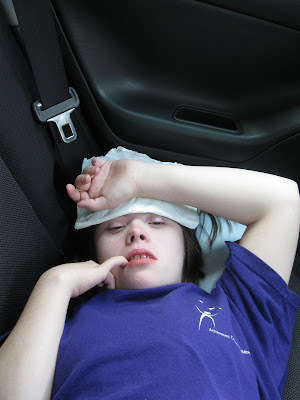 They told us they needed to reintubate as Sarah was destating and a culture had confirmed another life-threatening infection. 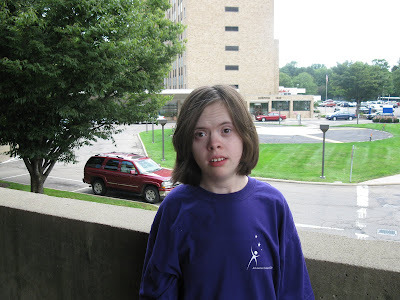 Much of Sarah's time in the hospital has become a blur, but that particular evening is still crystal clear in our minds. 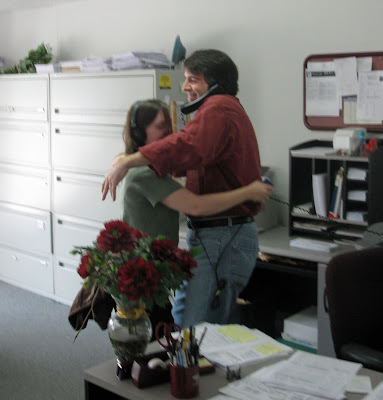 For that one phone call changed our marriage, forever. John and I both silently laid staring up at the ceiling. Tears rolled down our checks onto our pillows. Time seemed to be standing still, yet flashing before our eyes. And then I said, "Honey, can I ask you something?" Still staring at the ceiling I softly said, " Do you ever wish Sarah would die so she doesn't have to suffer anymore?" He grabbed my body and pulled me into a tight embrace and together we cried like we had never cried before. He too had been thinking the same thing for days but did not want to mention it for fear of loosing me, fear of loosing Sarah. I went on to tell him that on my way home from the Cleveland Clinic one evening, I had stopped at the cemetery to look at the new mausoleum. For some reason, I did not want my baby girl to be buried underground. He divulged that he had done the same thing. Alone. That night we promised each other that we had to start communicating again. We had to go back to being a team, not running on parallel lines, but together as one. We had to share our feelings, good or bad, happy or sad. I cannot think of another seven letter word in the English language that conjures up more emotion, than the word...d..i..v..o..r..c..e.
Ten years ago, we headed to our favorite local photo studio. Each August, our anniversary present is a photo setting. We take a group shot of the kids, single photos if there is a significant event such as Sarah's 10th birthday and a pose of just the two of us. In 1999, the photographer suggested that we sit on the floor with our backs touching. I jokingly said, "Oh, you mean the divorce pose." I'd seen it used in magazines many times. He looked at me with quizzical eyes, so I elaborated by using my finger to make a jagged line in the air as though I was cutting the photo in two. He laughed. But in reality, divorce is no laughing matter. Over the years the statistics have hovered around giving a couple a 50/50 chance of making it past the first few years. Add a child with a disability to the mix and that number escalates upwards of 65%. 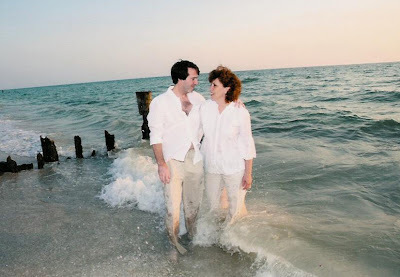 John and I recently celebrated 23 years of marriage. By now, one could assume we have it figured out. And on most days we probably do. Yet every now and then something hits us like a tsunami wave blast. The most recent, just yesterday. A relative was not happy about a certain blogpost I had written. So she called John at his office and started a mild tantrum. When that didn't work she threw in a few tears, some greater drama, followed by, "call her(Joyce) and tell her to take the post down...if she loves you... she will do it." John's reply, "And if she doesn't, what am I suppose to do, divorce her." John wasn't budging. So she next called me and followed the same pattern (I didn't know at this time she had already called John). I wasn't wavering at the threats or the tears or the escalating loudness of the voice. I was starting to question her mental stability, even feel sorry for her, but then she hit me with her fourth manipulative tactic, "If you love (John) you will take this post down." I was stunned. Whoa, now she was treading on sacred ground... my marriage. After I hung up with that call, I dialed John at the office to tell him what had just happened. He told me he had already talked with the same person. This made me angry. He then went on to relay what had been said. When he got to the word divorce, I said, "Exactly, yes, that is exactly what I want. A divorce. I am so sick of this drama. I want out. O-U-T. out. With that, I hung up the phone. I sat back in the chair and stared out the window for the better part of an hour. I was temporarily paralyzed as I tried to mentally process what had just occured. Then I took the blogpost down along with several others. For a few brief moments, I thought about going upstairs, packing a suitcase, jumping in my car and taking off, just me and Sarah. Although we have had many pictures taken since, I keep this one framed on our fireplace mantle. 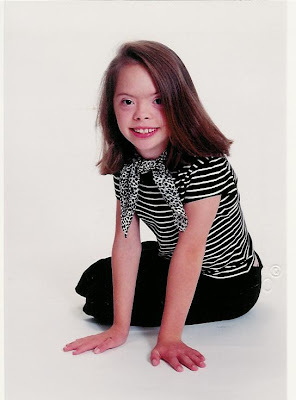 1999 was the year Sarah turned 10. 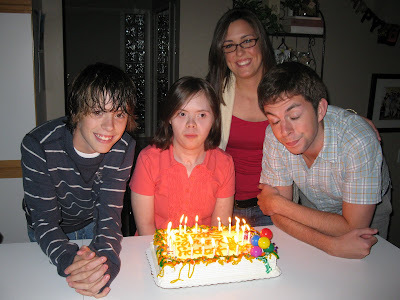 It was the year we celebrated ONE DECADE of LIFE. It was also the year the medical professionals thought we were losing her...twice. It was the year that she missed nearly 100 days of school, spending many of them in the hospital. It was one of the years that could have destroyed a marriage, yet instead we WORKED to make it stronger. How? With honest, truthful, and tender communication. ...So we walk in and went straight up to the CCU in the Heart Center. We walked to room 5 and guess who is sitting there? My big brother, TJ. Haaaa what is he doing here? Then I see my Grandma sitting up in her chair. She looked really good today. Yesterday morning she got a pacemaker. It is going to help her heart. So we stayed for a little visit. I told her all about riding Ridge today. It seems a little weird for me to be visiting someone in the hospital. I am usually the one in the goofy gown with the wires coming out of my sleeves. I am happy I can visit with Grandma though. It made her pretty happy. 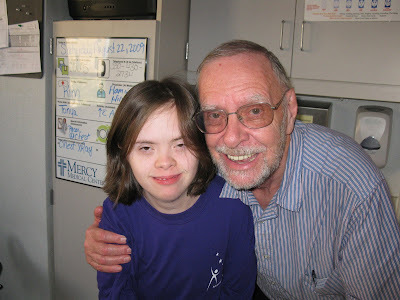 We took a picture of TJ and Grandpa before we left. Haaa grandpa is pretending TJ is taller than he is. He really isn't because Grandpa is 6'4" and TJ is only 6 feet. But that is still a lot taller than me. One hug for me before it is time to leave. I needed a nap because it was really hot at horse riding today. Get Well Grandma. I Love You. Sarah and I have written before about our dear friend Lisa. She was our neighbor girl who started watching Sarah from the time she was a toddler. Lisa is such a great friend and mentor and truly has had such a significant impact on Sarah being the young woman she is today. Lisa is now a Master level medical social worker at Akron Children's Hospital. 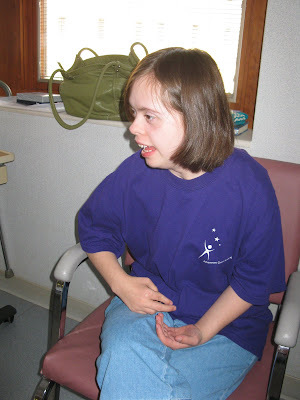 She has been asked to do a training on Down syndrome for all the Help Me Grow (name of EI program in Ohio) Early Intervention specialists for Summit County. She has asked Sarah and me to help her present, which we are thrilled to do. However, we are obviously a few years progressed from our days of early intervention. So, if you were speaking to this group - What would you like them to know? Thank you so much for your help. The talk is on August 26th. I am also going to ask them what they would like parents to know and we will post a follow up. Today my mom was helping me upload more photos to my video called Grandpa's Garden. All of a sudden I just started cracking up and then shaking my head. Do you see why? I'll tell you more about it after September 1st. That's the official day I can talk about it. P.S. We are just about ready to send out the second shipment of care packages for members of the military. We made 100 more cards and treat bags. We are just waiting for more APO/FPO boxes to arrive from the post office. If you are reading about this for the first time and you have a loved one in the military, please click this link and email me the mailing info. With a name like Smucker's, it Has to be Good!!! After horseriding today, we went to see my Grandma & Grandpa in Canton. 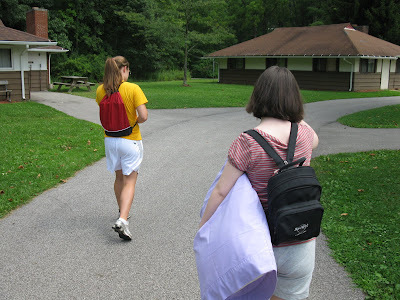 Our washer in Cleveland is broken and I have a lot of laundry from camp, so when we left we were heading to Columbus. We take route 30 from Canton which is a different way than we usually go. What the heck? I recognize that sign immediately. It is on the jelly jars. We walk in and the first thing I see is a Doughboy display. Look at this mom, sprinkles like on my cake at camp. OH how I LoVe 'Ol Blue Eyes. I have never seen him this big before. I want to take it home. Holy cow. Look at this wall of jelly!!! Even with all the different flavors I still went right to my favorite ~ Grape. There is even a Jif display. I guess if you have jelly you have to have peanut butter. Well, I bought a few things (it's a secret) but I got this cute little Doughboy stuffed animal for free. He even giggles if you push his stomach. This store is really cute. It is in Orrville, Ohio. The home of Smuckers. My Grandma used to live here so she graduated from Orrville High School. Look how cute these flags are on the light poles. It's like being in a grocery store. The sign at the end of the drive says, Thank you for Visiting. I'm glad we did. That was fun. If you are ever in Ohio, you should check it out. I was all packed up and waiting for my mom in the great hall. I was so happy to see her I was waving and pumping my fists in the air. My mom wants me to show you this newsletter she gets when she picks me up. She says it helps her to know what I did. I do not know what she needs a piece of paper for, I talked for 45 minutes, the whole way home. I love telling everyone what I did at camp. She really like this report too. They do one each day of the week. On my report today it said I was homesick. That's because I knew in the morning it was time to go home. ...snoring!!! My mom just opened all the windows and left me there until I woke up. 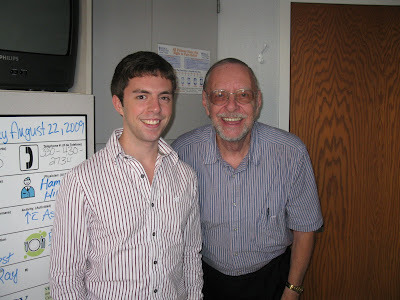 I am on my way home from camp, but first I had to stop at my Dad's office to see him. I had such a good time, I will tell you all about it later. 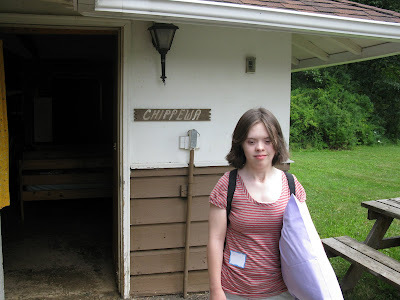 At 2:40 today, we dropped the birthday girl off at Camp Cheerful in Strongsville, Ohio. 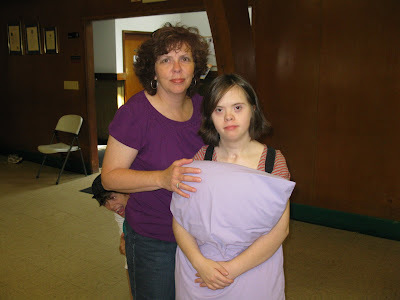 This will be the eleventh year straight that she has attended this week long resident camp. It has gotten a little easier for this mom, although I still get teary eyed as I walk back to the car without her. I truly believe this is a great experience for her. Being away from mom and dad, even for a week, creates greater independence and self confidence. She basically registers herself now. 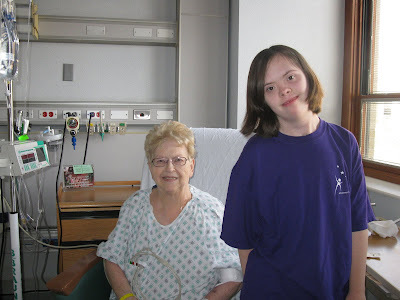 I make one short visit with the nurse to drop off the nebulizer and her asthma meds. 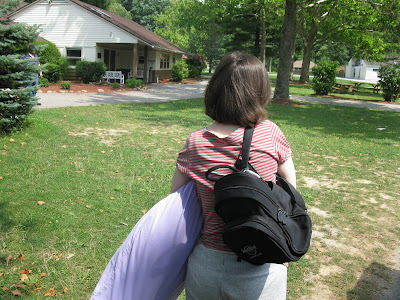 The bag is much lighter than in the first few years when we had lots of medications. I originally chose this camp because the counselors are trained to take care of kids who had trachs and other special needs. 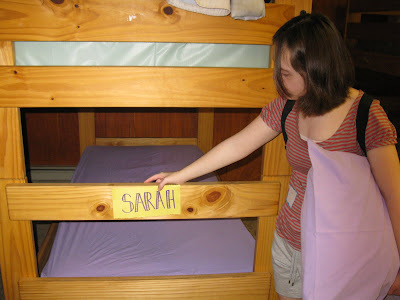 As the years went by and Sarah became healthier and stronger, I realized that she does not necessarily need to be at this camp, but for one week she becomes the helper of those needing more care than she. 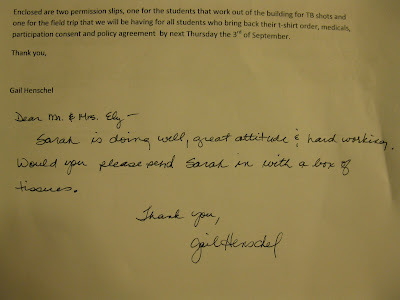 And for most of us, including Sarah, it is a good feeling to be helping others. 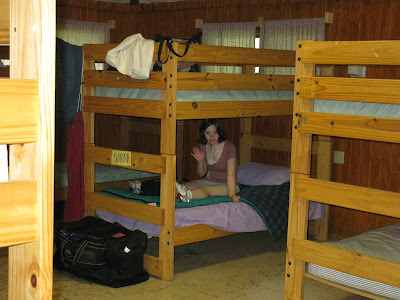 There are usually two cabins for females and two for males. 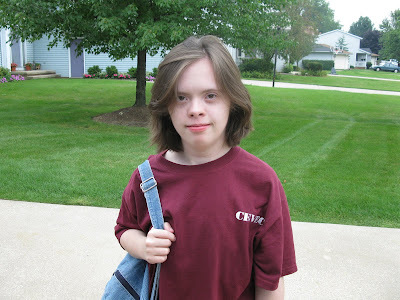 Chippewa has frequently been Sarah's home away from home. 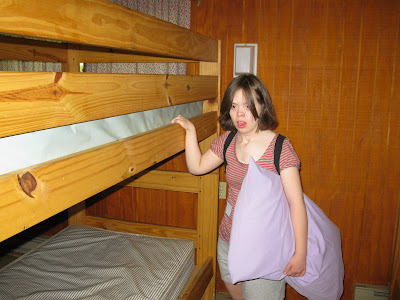 She almost always picks the same lower bunk, one away from the corner. Something new this year. They put her name at the foot of her bed. She liked that. After the bed gets made, she always has to try it out. It is a humid 90 degrees today so I tried to convince her to open up her sleeping bag, but she wasn't to keen on that idea. The little brother came along to see where she would be staying. Sarah wanted Matt to come over and try out her bunk. We don't like to stay too long for fear that she will not want us to leave. This is the one week each year that we can focus on the boys or our marriage. Some years John and I take off for a little "honeymoon," other years we just spend more time with the boys. It's nice having a break without the need to stop for breathing treatments and medical intervention. So one last wave and then we are out of there. I usually head to a really great mall that is just down the street from the camp to unwind and get my emotions in check before getting back on the highway. Sometimes I am by myself, but today I have John and Matt with me. We went on one marathon back-to-school shopping trip today. You can check it HERE. As we were walking across the parking lot today Matt said, "All of a sudden I feel like an only child. If Sarah were a typical sister she would be leaving for college and it would be like this everyday. But I'm glad she's not because I like having her around." And with that, I find more tears flowing being grateful and so proud for having the privelege of raising such a great son.